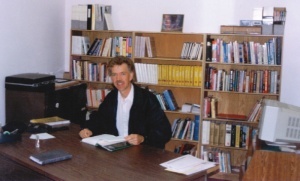 Pastor Peter Dueck, September 1995. Source: Menno Hamm, Editor, The Messenger. Westpointe Community Church, an Evangelical Mennonite Conference congregation, began in 1991 in Grande Prairie, Alberta, because some families wanted to worship in a fellowship more familiar than a non-Mennonite evangelical church. In the 1980s families from La Crete and High Level, Alberta, began moving south to Grande Prairie (also known locally as Swan City). Early in 1990 some families began meeting on Sunday evenings for fellowship, Bible study, and prayer. In spring 1990 the Evangelical Mennonite Conference’s Region One leadership retreat included discussion of a church start. On 17 June 1990 a steering committee was formed in cooperation with the Evangelical Mennonite Conference’s Board of Missions. Peter and Trudy Dueck were engaged as church planters and on 13 January 1991 the first service was held on the Trumpeter Motor Inn with 45 people present. In mid-1991 services were shifted to the Nordic Hall, with Sunday School held; it was home for four years. On 2 June 1991 Harvey Plett and Ben Friesen officiated at the Swan City Christian Fellowship’s chartering service with 18 members. In 1993 a 1.3 acre plot was purchased in the Mission Heights subdivision. Construction began in fall 1994 on a one-level building with a seating capacity of 250. On 14 May 1995 a dedication service was held. The congregation was renamed as Missions Heights Community Church. Later a new building was constructed in the Westpointe area and the congregation became known as Westpointe Community Church. The congregation began to use the building in January 2012. Peter and Trudy Dueck ended their pastoral ministry in mid-August 1991. Pastoral couples who have served since include Peter and Martha Doerksen, Rick and Lori Hall, and Dwight and Sherry Munn. In 1995 the congregation had 43 members and averaged 100 at a worship service. In 2012, Westpointe Community Church had a membership of 96 and an average service attendance of 250. Brandt, Betty. Interview by author. Steinbach, Manitoba (5 February 2013). EMC Yearbook for 2012 (including a record of the proceedings of the 62nd annual sessions of the Evangelical Mennonite Conference July 6-8, 2012). Steinbach: Evangelical Mennonite Conference, 2012. Hamm, Menno. "Mission Heights Community Church." The Messenger 33, no. 15 (6 September 1995): 7-9. Smith, Terry. "Westpointe Community Church (Grande Prairie, Alberta, Canada)." Global Anabaptist Mennonite Encyclopedia Online. February 2013. Web. 19 Apr 2019. http://gameo.org/index.php?title=Westpointe_Community_Church_(Grande_Prairie,_Alberta,_Canada)&oldid=156154. Smith, Terry. (February 2013). Westpointe Community Church (Grande Prairie, Alberta, Canada). Global Anabaptist Mennonite Encyclopedia Online. Retrieved 19 April 2019, from http://gameo.org/index.php?title=Westpointe_Community_Church_(Grande_Prairie,_Alberta,_Canada)&oldid=156154. This page was last modified on 13 December 2017, at 19:21.